You speak of China being a “de facto participatory culture”. Could you explain more about why this is? First of all, participatory culture is a very common feature of user-generated content, particularly for fan fiction, fan subbing, and fan translation. A general belief in participatory culture is that everyone’s contribution matters. Regardless of the activity one has performed, every tiny act contributes. In the case of Yeeyan (the Chinese crowdsourcing community I am investigating), the community members are mostly translation students and amateurs. They usually play multiple roles, including source-text provider, translator, proofreader, project manager, commentator, reader, and promoter. One may put tons of effort in the community; another may simply act as a reader who consumes what others have generated. It is all these different roles and acts that support the full functioning of the community, just like in commercial industry. I have a graph that visualises the role play and work flow in Yeeyan to show the circulation of a full-functioning crowdsourcing community; I’ll explain more about it during my presentation. In what other ways does crowdsourcing in China differ from crowdsourcing in the West? The application and work flow in crowdsourcing practice in China differ from crowdsourcing in the West and so do the quality-control methods. My research focuses on collaborative translation projects. In the community I am investigating, there are two types of projects: self-organisation oriented and professional-organisation oriented. They both follow the standard TEP approach, except that the self-organised projects do not follow a sequential order. Translation and proofreading may be processed simultaneously. I also did a quality evaluation of the translation generated from each stage of the project, from draft translation to the final version. The result shows that peer review works better as a quality control method and greatly reduces the number of errors. In the West, on the other hand, few quality-control methods are applied. The usual case is that people are asked to perform one task at a time. For example, in Facebook, users translate one segment, and the translation is then rated by other users. As for application, the Chinese community concentrates more on translation of articles and books. There is an ongoing Gutenberg Project, and lots of people are involved translating books in the public domain. 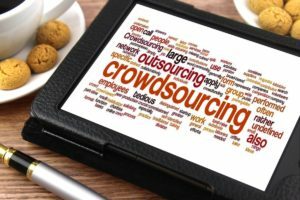 The work flow and application of crowdsourcing in China operate more like a training environment. It makes the crowdsourcing community a stepping-stone for trainees and amateurs to enter the professional world, enabling them to get an early look at how translation works and to gain more experience. What do translators typically talk about when they are collaborating online? Communication is a key aspect that I am going to talk about in my presentation. I elaborated the types of interaction in light of the communication function in MNH-TT (a collaborative platform for translator trainees). Basically, we have interactions in making requests, making clarification, and discussion. The requests can be inquiries on the project requirements, work flow, translation problems regarding the glossary, and text-level problems (e.g. one cannot understand a segment of the source text and asks for help; other members intervene and discuss the problem), etc. I analysed the interactions among the translators to explore the features of network in crowdsourcing community. The result will also be explained in my presentation through visualisation. How has the advent of crowdsourcing changed the translator’s mode of work in China? I wouldn’t say that the advent of crowdsourcing has changed the translator’s mode of work in the professional industry in China, but it should be considered as an alternative approach for language services. It can be made better use of if organised properly. A lone translator model does offer some benefits, such as consistency of style. How does crowdsourcing translation overcome this? Consistency can be achieved through multiple ways. For example, a glossary list can be used to assure consistency of terminology. In addition, other quality-related problems are often solved by peer review: in a collaborative project, participants cross-check each other’s work. The ideal mode is to integrate high-level translators (experienced members) with entry-level translators. Finally, in a collaborative project, they usually include a subject-matter expert to do the final review. If not, the project manager is responsible for the task. The final review focuses on the language level and the style. As for projects that aim for publication, e.g. the Gutenberg project, that require the recruitment of high-quality translators, the project manager runs a sample test, seeking qualified translators with similar style. In addition to the above methods, an in-house editor is involved during the review stage. How is quality assessed in crowdsourced translations? Does more need to be done in China to improve quality assurance? There are mainly two types of translation in the crowdsourced environment: one is translation for knowledge sharing, the other is translation for publication. The former does not necessarily need high-level quality; gist-level quality is usually acceptable to the audiences. The common mechanism is that after translation is finished, readers can review the work through a comparative view of the source text and target text to pick out flaws and make suggestions. Translators can improve the work accordingly. For the translations that are to be published, high-level quality is assured by self-review and peer review and then assessed by the in-house editor or proofreader. As mentioned earlier, it is achieved through the contributions of various actors. I need to mention that the answers I have given so far are all experiences of successful projects. There are also failed ones, which I haven’t investigated.